The first thing we will look at is how to work out the length of a vector. Take a look at the diagram and try to grasp that we can determine the length of every vector there. First go to the iamge in the left. 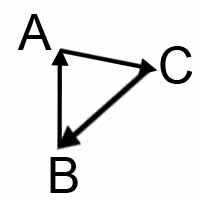 You will see a triangle with sides of length a, b and c.
The vector a is facing towards c, the vector b is facing towards a and the vector c is facing towards b. 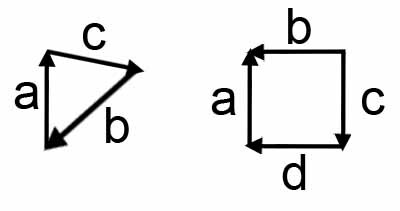 So to work out the length of the vectors we start at the end of the vector WITHOUT the arrow and work our way around to the end with the arrow. Because to work out the negative value, we start at the other end. 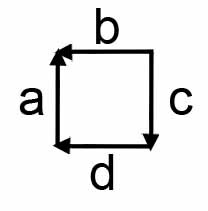 You have to take into account that moving in the same direction is positive and moving opposite to the arrow is negative. Keep in mind that no matter what shape you have, you ALWAYS work it out the same way. And thanks to vectors being what they are, this will always work. In this part, we are going to be looking at the length of a vector in almost the exact same way as before. 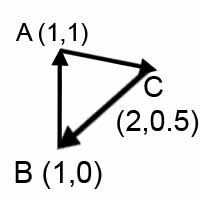 Only this time, the characters, a,b and c are not lines, but points. To work out the length of these, you just have to work it out a little differently. The arrow above it just represents a vector instead of a normal line. And to work that out is exactly the same as before. Where the lines | | represent the length. Here we are going to be acctually calculating the length of the vector using numbers. And vectors dont acctually have a length measuring system like cm, m, km etc. They are just measured in units. One Response to "4. Maths Vector Length"